AUD is supported by the National Australia Bank’s survey regarding the strong global economic outlook. The support rests at 0.80190 with resistance at 0.80870 which the weekly pivot point at 0.80660 is located in between the lines. The EMA of 10 is moving with bearish bias in the ascendant channel but it is above the EMA of 100 and the EMA of 200. The RSI is falling towards the oversold area, the MACD line is below the signal line in the negative territory and the Stochastic is showing downward momentum. The ADX is showing sell signal. The price is in the Ichimoku Cloud and below the Chinkou Span. The Tenkan-sen is showing a downward trend while the Kijun-sen is showing a horizontal trend. 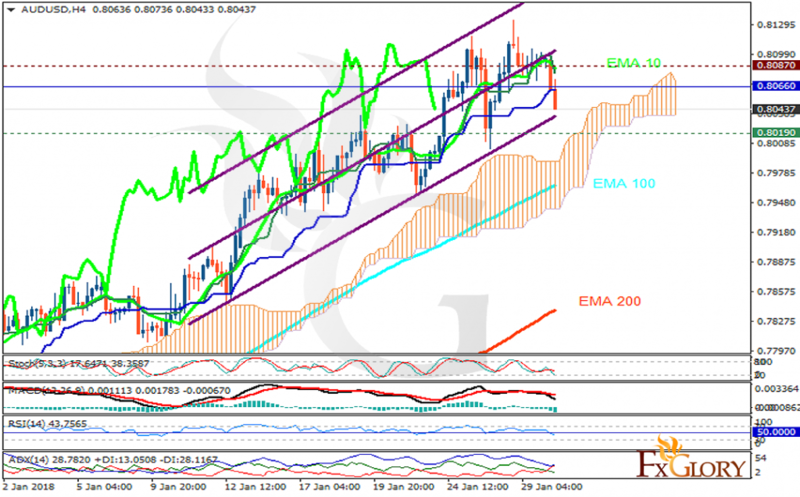 The support area seems to be strong therefore AUDUSD may not fall lower than 0.80.